It was her first assignment as a T-FLAC operative, and Alexis Stone had already broken one of the rules. And she made a habit of following the rules. After all, she had a photographic memory and couldn't claim to not know them. However, she had planned on simply observing, so hadn't worn her LockOut protected clothing, and ended up engaging in a gun battle which resulted in her being injured. And to top everything else, Alexander Stone was in her room at the safe house in Moscow. It totally disconcerted Lexi to run into him there. She was supposed to meet up with him in Paris, as his newest partner. What he didn't know was that she was also on orders from Internal Affairs to observe him. Alex wondered whose brilliant idea it was to move Lexi from the research department to the field. Sure, she could rattle off facts and figures of every place they were going, but she definitely had the potential of being too much of a distraction for him. Not that he was opposed to female operatives, just Lexi as one. Especially on this case. There were too many variables, himself included. His wizard powers weren't fully functioning, and that definitely affected him as a T-FLAC/psi operative. Night Shadow was the final story in the T-FLAC Night trilogy. The third of three orphan wizards who grew up together, Alex is a dedicated operative intent on saving the world, even from himself. He is having difficulties with his powers, just as we had learned his friends were. Now, we learn the truth of what was happening. 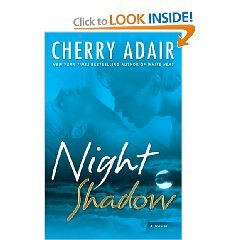 I really enjoyed the romance, subtle humor, and the non-stop action indicative of a Cherry Adair novel. However, to be honest, I was a bit sickened learning the truth behind everything - I thought it was a bit much for a romance.